Twenty-five years and just over 60 percent complete, the Dictionary of Old English is a labour of love for U of T scholars. 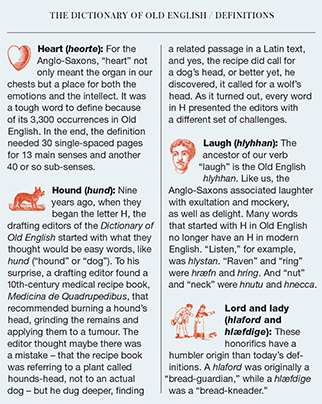 On a scorching summer day two years ago, his first day on the job as a drafting editor at the Dictionary of Old English, Stephen Pelle was tackling heaven – or more accurately, was trying to define heofon, its Old English equivalent. Hunched over a table, he laboured like a medieval monk reviewing every citation of heofon in the corpus of Old English texts. An assistant professor at the University of Toronto’s Centre for Medieval Studies – where he also earned his PhD – Dr. Pelle already had years of experience proofing Old English words. Yet his job that day was not so heavenly (or heofonlic, as it would have been spelled 1,200 years ago). The newly hired drafting editor had sorted scads of Post-it notes and more than 4,000 slips of paper into precarious piles. Each slip contained a different citation of heofon and each pile represented a different sense or meaning of the word. Dr. Pelle’s goal was to create a hierarchy for these meanings. He knew that defining every sense of heofon would be a challenge, but at that moment his most pressing concern was that someone might fly past the table and inadvertently blow away the carefully ordered slips. What had he gotten himself into? The team behind the Dictionary of Old English, an ambitious, long-term project based at the Centre for Medieval Studies, has set out to define every known English word used between the years 600 and 1150. In a sense, it’s a project that will catalogue the very DNA of our language. Now 46 years in, the project involves six staff and an army of students. Along the way, generations of dedicated scholars have rediscovered medieval ways of thinking and re-assessed the meaning of texts from the Middle Ages. When finished, it will be more comprehensive than any dictionary of English – more detailed than the Bosworth-Toller Anglo-Saxon dictionaries of 1898 and 1921, and more exhaustive than the venerable 20-volume Oxford English Dictionary. The new dictionary resurrects long-dead words and unearths the ancestors of many words we still use today. It also includes the number of times a word appears in Old English texts – from gospels and poetry to legal documents and royal records. Eight volumes – the letters A to G, with a separate volume for the letter Æ – took about 25 years to complete. The Old English alphabet has 22 letters in total and the finished dictionary should have between 33,000 and 35,000 individual entries. Despite it being a work in progress, hundreds of universities around the world have already subscribed to this digital, online dictionary (no print version is envisioned). The letter H was started about nine years ago. In that time, dictionary staff have made several technological advances, including an upgraded search engine, and added hyperlinks to other dictionaries and images of related manuscripts. Letters I to Y (the last letter of the Old English alphabet) may take a few years or a few decades. The timeline depends on funding, which comes mainly from subscription sales, private donations and contributions from foundations in Canada and the United States. Among the agencies that have provided long-term funding are the Andrew W. Mellon Foundation and the U.S. National Endowment for the Humanities. After eight weeks of work that first summer, Dr. Pelle summarized heofon into 10 main definitions, which, along with citations, filled 70 single-spaced pages. The meanings fell into two broad categories: heofon as a part of the sky and heofon as the abode of God. However, in some cases the word also referred specifically to God’s power and, in one poem, was possibly miswritten for the word h-eof (lamentation). Scribes made mistakes in those days, when most literature was hand-copied by monks. One depiction of Heofon from a manuscript. It depicts the fall of the wicked angels from heaven into hell. Photo courtesy of The British Library Board Cotton Claudius B.iv, f.2. “Heofon was actually a baptism by fire,” says Dr. Pelle. “I’d written a few academic papers about what the Anglo-Saxons thought heofon and hell looked like, concretely, but the word itself was hard, and H will probably be the most difficult to define of all the letters.” After words beginning with the letter S, Old English words beginning with H are the next most numerous, at about 3,000. Words beginning with H are also some of the most complex and most popular, including “she” (h-eo), “he” (h-e), “it” (hit) and their plural forms. The passion for antiquated words at U of T began with Angus Cameron, a professor of medieval studies who founded the Dictionary of Old English in 1970. The project’s first tasks were to count and categorize all surviving Old English texts, then to input them into an electronic database. Staff assistant Elaine Quanz spent nearly six years typing out Old English texts using a special IBM Selectric font that could be scanned into a mainframe computer. Work began on the dictionary entries themselves in 1982, while the digitizing continued. Back then, the computers were as big as closets. Dr. Pelle and colleague Robert Getz, who also has a PhD in medieval studies from U of T, were both hired in 2014 as the dictionary’s interim directors. (The project expects to appoint a new permanent director later this year.) They replaced David and Ian McDougall, twins who had worked as the project’s drafting editors for 30 years. Drs. 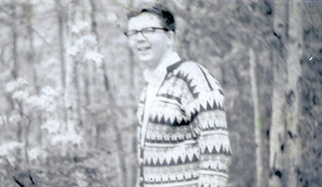 Pelle and Getz each had held a research assistantship at the DOE as doctoral students and had worked under former directors Toni Healey and Roy Liuzza. While Dr. Pelle grappled with heofon, Dr. Getz dove into hell on his first day on the job. The dictionary’s labyrinthine offices contain nearly a hundred black filing cabinets overflowing with folders. An editor usually starts tackling a word as Dr. Pelle did by consulting a folder stuffed with slips of paper containing citations from medieval texts. But Dr. Getz’s first day was different. The slips for hell were missing. Instead, Dr. Getz began his journey through hell by searching every use and spelling of the word in every surviving Old English text, everything from sermons to contracts. His colleague would print each citation and Dr. Getz would sort the paper slips into different contextual senses using rubber bands, paperclips and shoeboxes, just as Dr. Pelle was doing with piles and Post-it notes for heofon. 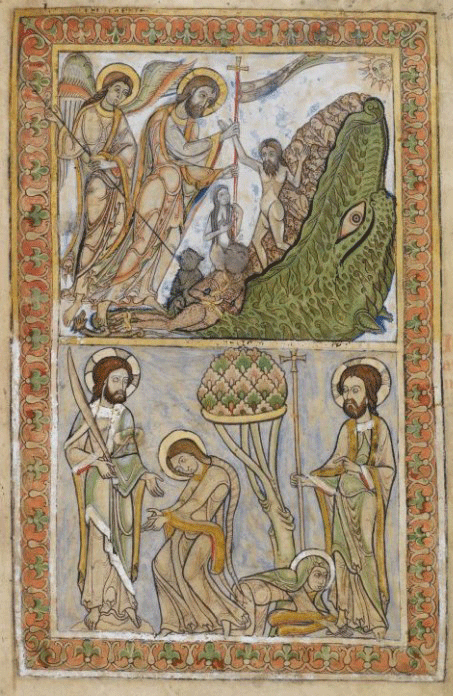 A picture of the “Harrowing of Hell” (i.e. 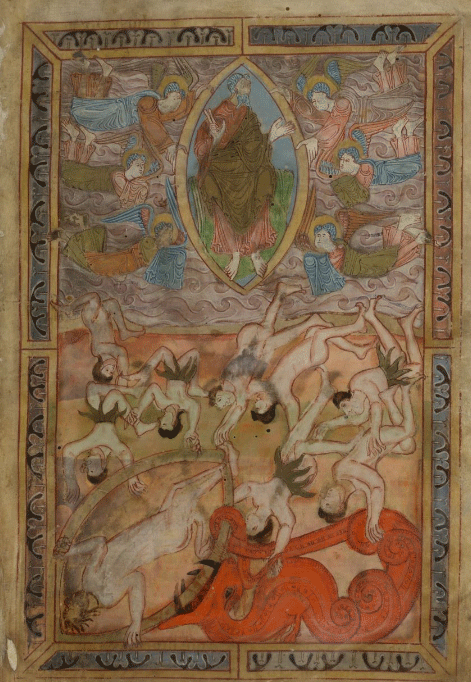 Christ’s rescuing of souls from hell, in this case meaning the place of the dead, to which he descended after death) from a 12th Century English manuscript. Photo courtesy of The British Library Board, Cotton Nero C.iv, f.24. Dr. Getz found 900 citations of hell in the dictionary’s storehouse of digitized manuscripts and nailed down its various definitions in six weeks. Like today, its original meaning was a kind of limbo for the dead or an underworld for the damned. The metaphorical use of the word to mean a personal nightmare became common only many centuries later. In the end, “hell turned out to be a lot of fun,” he says. 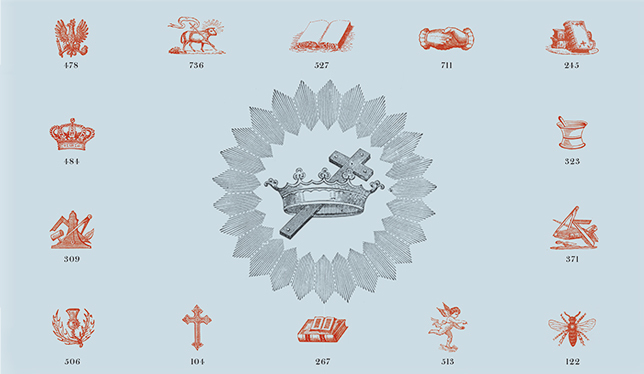 The word appears in curses at the end of Old English contracts or charters, a common ending similar to our disclaimers at the end of corporate emails. Dr. Getz reads an example: “If anyone through any presumption or the instigation of the devil will violate this privilege, then after his accursed death, let him lie forever in the bottomless pit of hell and burn in the eternal fire with the devil and the accursed spirits that dwell with him, forever without end.” But the curses weren’t all fire and brimstone. “Often there was an out in the curse, such as, ‘Let him burn in the frying pans of hell, unless he makes amends or repents beforehand,’” Dr. Getz explains. The medieval period was an age steeped in religion, but also much more. Medical texts, for example, would calculate the best days for bloodletting, or would describe the best remedies for ailments such as the “half-dead disease” (probably hemiplegia). One remedy involved melting and mixing wax, pitch, pepper and oil and sticking the goo on the half-dead patient. Anglo-Saxon manuscripts also contained charms to protect livestock, to prevent demonic possession and to cure diseases caused by an elf’s arrow or spear. This was an era when magic and miracles were as real as Vikings and dwarves. Author J. R. R. Tolkien knew this, and the richness of his books emanates in part from their basis on Anglo-Saxon civilization and culture. He was a professor of Old English and drew heavily from the language for The Hobbit and his other works, starting in the 1930s. For a time, he worked on the Oxford English Dictionary and was well known as a perceptive reader and textual critic of Old English poetry, including the epic Beowulf, the most famous text from Anglo-Saxon England. He also made up his own languages, including Elvish tongues, Black Speech and others for The Hobbit and The Lord of the Rings, and he borrowed names, riddles, anecdotes, themes and literary styles from Beowulf and Old English in general. For example, Beowulf is a king who defends his people from a fire-breathing dragon who’s angry over a missing goblet, much like the plot found in The Hobbit, Dr. Getz explains. Dr. Getz, for his part, does not have the luxury to go on and on. A past dictionary editor told him that the hardest part of the job would be trying not to fall in love with a word. “You have to be brutally efficient, define each word, move on to the next,” he says. The goal is to finish H in 2016, then continue to the next letter. Nevertheless, Dr. Getz says hwæt, from his favourite Old English poem, may well be among his favourites. It may even prove to be more fun than hell. This is beyond beautiful! Need any help? I don’t understand the problem with Hwæt, as it is still in use in North east England although it has morphed to Ha wa?